Apex Trampoline Packages start at $16.19 per jumper including grip socks and although there’s a concession available, you can bring in outside food and beverages if you book a party room. Bartari Video game fan? Introduce them to the games you grew up with at Bartari, which features retro consoles and face-to-face video game tables. Make a reservation, pay $5 per person for unlimited gaming, and open a tab for snacks and bevvies. 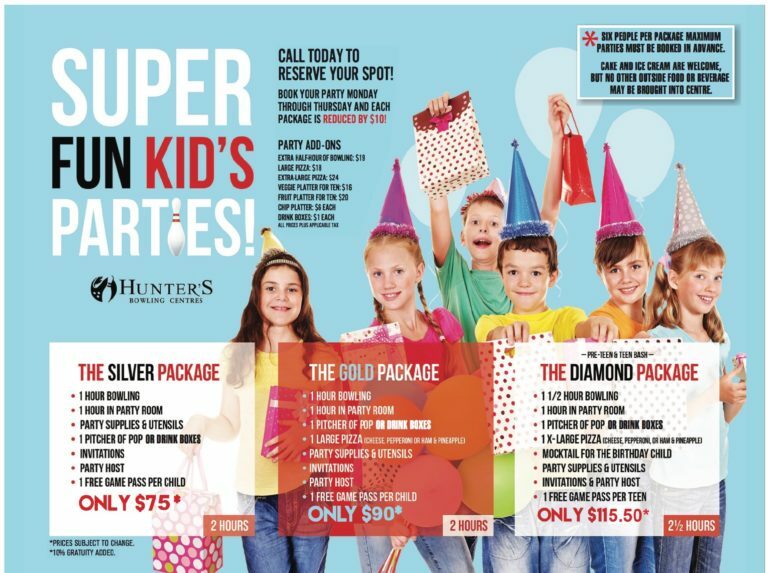 Bowling Hunter’s Eastview and Fairhaven locations offer parties ranging from $75-$115 that all include a host, party room, pop or juice, some free passes for your loot giveaway, and plenty of bowling. Glow bowling is available at certain times. Breakout Sask Although most escape rooms are geared toward an older crowd, Breakout Sask has birthday packages specifically for kids, starting at $150. It includes 2 hours in a private escape room, free popcorn and candy, and you’re welcome to bring in a cake (plates and utensils are provided). CJ's Climb and Play Although technically in Warman, CJ’s is a popular destination with packages starting at only $12/child. Claire’s My daughter is obsessed with Claire’s and as if we need to spend more time there, now they host birthday parties. 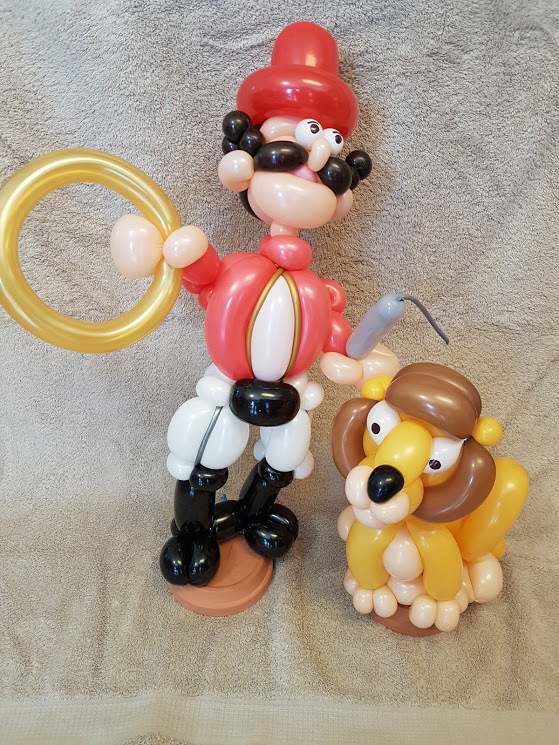 There is a staff member who leads a few activities (treasure hunt, try-ons, balloon relay, nail painting) and your only cost is spending a certain amount per guest (minimum 6 kids), loot bag style. Clip & Climb Climbing the coolest walls in town will make for an unforgettable birthday. Packages range from $225-$345. Creative Haven YXE Whether it’s a paint party, slime fest, or vision boarding, Creative Haven is the destination for imagination. Parties start at $200. Crickle Creek Although they don’t do dedicated birthday bookings, Crickle Creek has everything a kid loves: ice cream, mini golf, and the most amazing inflatable bouncers. New this year is BBQ and pizza on premises, so if you want to bring outside food, you’ll be picnicing on the grass outside the fun zone although you’re still welcome to bring a birthday cake in. There is also birthday pricing. 2- 3 year olds: Fun Zone and small ice cream cone or Slush for $6.50/child; 4 and up: Fun Zone and small ice cream cone or Slush for $11.00/child. Add a hotdog for an extra $3.50 per child or a hamburger for an extra $4.00 per child. Dutch Growers Put your child's green thumb into action with a planting workshop, with private bookings averaging $35/kid. The arrangements can be tailored to interest, like adding dinosaurs or fairies, and you're welcome to bring food and cake in provided you clean up afterward. Princesses: King’s Castle, Saskatoon Princess Parties, The Enchanted Garden, or (and this is my recommendation because the princess we had in had the most magical voice): A Dream Come True. Fairy Door Tours. Located in Kinsmen Park, Fairy Tours is just right for your summer baby who still believes in magic. A private tour is $240 and there are picnic tables near the start point where you are free to bring food. Flynn's Forest Flynn’s is my go-to for letting the kids run wild and they have packages that start between $190-$375. Fly Studios Aerial arts makes for a high-flying birthday! An hour party is $225 up to 10 kids and a two-hour that includes an hour of party room rental goes for $305. Fun Factory They’ve been at it for ages and it figures they’ve got a party package to suit every group size and need. Prices range from $199-$1299. 4Cats Art Studio Paint or clay, the kids will have fun creating and getting messy! Parties are about $225 for ten kids. Grand Slam Batting Cages Enjoy a Fudd’s lunch and then let the kids step up to bat next door. $3/15 pitches. Taiso Parties are an hour of lead gymnastics and range $150-$205 depending on the number of children. You also get 45 min in a private space to have cake, open gifts, whatever you’d like. Marian Parties are $157.50 and there is a Nerf gun option that looks pretty neat. Either the Nerf or regular gymnastics parties include 45 min in the party room. Can-Am We’ve made Can-Am our family gym because the staff is incredible, there’s a beautiful set up of equipment, and the viewing area (where the party rooms are) is pristine! Cost ranges from $180-$220 and includes an hour of gymnastics and 45 in the party room. Grip It If climbing is your child’s favourite activity, this is a great one. Cost is $25 per climber with a minimum of 5 and maximum of 10 guests. They’ll get to climb for 2 hours and have an extra 30 in the party room (where parents have access the whole party). Ignite Danceworks An hour dance class (of any style) plus 45 minutes in the studio and themed decorations of your choice starts at only $175. Jerry’s Food Emporium Jerry’s on 8th has a dedicated area for play and although you can’t stop other people from coming to play, you can reserve the tables in there at a time where it’s not normally busy (I did this on a Sunday around 3 and it was ideal). We just ordered fries, ice cream cake, got beverages for people, and hired LaLa the Cutest Clown to come in and it was a perfect little party. LaLa’s Little Farm LaLa is not only a clown but the sweetest person who has a visitor-friendly farm. Contact her to set up a birthday event, or to have her bring bunnies or chicks (season-dependent) to your location. Learn & Play Cafe Toys, toys, all kinds of toys. Dress up, drawing, a puppet station… you name it. Price is regular entry plus $40 for an hour the party room and juice is included although you can choose a variety of extras like cookie decorating or a craft. The Local Kitchen YXE Book a beautiful space with kitchen amenities for $300/3 hours where you can bring in your own cooking supplies and do the leading on your own, or hire a helper for $100-$300. There are also hands-on cooking classes with a real Chef where 10-14 guests create stunning 4-course meals to enjoy together at the end, which range from $89-$100/guest which seems like a milestone birthday kind of event to me. Mar's 3D glow-in-the-dark mini golf A round of the coolest golf in town plus 45 in the party room is at a cost of $16/person. Market Mall I love the mini golf at Market Mall, all full of dense foliage with a pond full of giant koi fish that my kids can’t get enough of. Okay, I think the fish are amazing, too. For $11.49/guest, get a round there plus lunch at the Coachman and you can add a game or movie at the Virtual Reality Centre for only $5.75. Menchies Frozen Yogurt Make-your-own yogurt sundaes sounds like a good time but when the setting is as cute as Menchies, you know your party will be instagram-worthy. Michael's Crafty kids will enjoy creating with a Michael’s team member (starts at $120 including invitations, craft supplies, and use of the room) or do your own thing, bringing in your own supplies for $50). Add facepainting for $25. Momentum Martial Arts Pool noodle sword fights, Nerf gun wars, a martial arts lesson, AND they get to cut the cake with a Ninja sword? Yes please. Landmark With free birthday admission, a room rental for an extra $50, reserved seating, and plenty of extras available to add on, this comfy theatre is a good bet. Rainbow Theatre A birthday party package includes admission to a matinee movie, kids combo treat pack (popcorn, drink, and candy treat), plus a loot bag. Scotiabank VIP Theatre or Cineplex at Centre Mall A movie, kids’ combo, reserved seating, and a birthday gift of a free admission to the birthday kid next visit is included in the standard ($104 for 8 kids, $13 for each extra child), or available only at VIP, a Premium package includes a party room for 1 hour where you can serve your own cake ($120 for 8 kids, $15 for each extra child). Nutrien Playland $20 gets you 12 tickets, and there are three big rides available: the classic carousel, big Ferris wheel, and the train, so divide them up how you’d like and then enjoy a party picnic (concession available but outside food is fine) before letting the kids loose on one of the neatest playgrounds in the city. Both my kids were December babies so if this is an option for you, I am jealous. Nutrien Wonderhub (coming this June!) My husband does the marketing for Nutrien and my sister in law is with the Nutrien Wonderhub so obviously I’ll be circling on back here to keep you updated on this! Optimist Hill Winter birthday? A Optimist Hill lift pass is $10-$13 per kid (5 and under are free with a parent) and a tubing pass will be an additional $5. A chalet with a concession is on premises. Petland If you’ve got an animal lover, this party’s for them. For $225, you can either have a Pet Councillor come into your home with 6-8 animals (reptiles, rodents, birds, you name it, just not cats since they are technically SPCA residents) giving facts and facilitating interaction OR have the same experience in Petland’s party room that accommodates 15 children. The benefit to the party room besides no pre-party clean-up is that you get an extra hour in there, so the kids can enjoy snacks, cake, and whatever else you’d like to bring in. Pokey’s Pinball Cafe Pokey’s has all the classic pinball games and a menu that’s kid birthday party approved. Stay tuned for updated pricing. Prairie Jurassic Does your little one love ACTION? From glow dodge ball, archery, and laser tag to Nerf wars, Prairie Jurrasic is their scene. Packages range from $289-$335 and welcomes kids aged 6+. Ramada Golf Dome A small basket of balls is $10, so just buy a few and get the kids driving. Mini golf is at no cost if you're using the driving range and there's a lounge with tables and chairs where you're welcome to bring in snacks like veggie trays and chips... And of course, cake. Beverages are available to buy on site. Remai Modern A tour of up to 30 kids with 5 adult chaperones is $240 and includes some creation time in the studio. The only caveat here is that food isn’t allowed, so either you can take the kids to Shift (where there’s lots of kid-friendly bites) and if it’s summer, a picnic and River Landing spray park is a good ender. There’s even an ice cream shack. Or, pro tip, Sundays 1-4 the workshop is free for Scotiabank Something on Sundays so you can get a bit of art-making in, visit the free portion of the gallery, and still do a River Landing party. Saturday 12-5 the workshop is open, included with admission. Saskatoon Public Library Rooms I used Round Prairie for its beautiful light-filled room and it was only $50 including tables, chairs, and a little kitchenette. Ruckers Ranging from $13.99-$16.99 per child, you can let the kids do their thing at Ruckers gaming centre and wind things up at Fudd’s with a fresh baked cake and milkshakes. Saskatoon Blades Bleed blue? The Blades offer great packages including an opportunity to high-five the team as they come off the ice for $275-$300 and if you’ve got a superfan, they can even get some ice time themselves during O Canada or holding the flag for $300. Skating Jemini hosts parties for $125 that include an hour of skate time with a food order and ACT, Archibald, Cosmo, Gordie Howe Kinsmen, and Lions Arena do rink rentals that range $170-$275/hour. Or if you’re up for some outdoor fun and everyone in your party has skates, Boffins has the most picturesque rink in town complete with a bonfire to roast marshmallows. If skate ownership’s an issue, the Cameco Meewasin Skating Rink at Nutrien Plaza has free rentals and if you make it a Sunday brunch party, you can head straight from across the street at Cathedral Social Hall where kids are welcome 10-2. Soccer Centre Have your toddler's birthday between 9am-1pm Monday to Friday for only $40 in conjunction with the play group (there are riding toys galore) or rent a whole field for any sport and choose from a variety of meal options (contact for details). Swimming at a Leisure Centre Party packs range from $180-$260 and include the room rental, activities with a leader, a loot bag based on the theme you choose, and an hour of swimming. Sobeys cooking party Your little chef will have fun making and eating food with their friends. Packages start at $229 and include a host for 2 hours, loot bags, and decorations in their cooking room. Spa Day Let your little can relax with friends while feeling pampered. Beverley Ashdown, Just 4 You, Changes, and Paramount all offer group packages and Damara Day Spa has a Little Goddess package with special pricing and services. Sportball Whether you want to use a Sportball facility or have a leader come into your backyard or home with equipment, Sportball offers a variety of physical, fun activities to burn off that kid energy. Starting at $144. Rent a gym with access to equipment at a school ($41.50-$51.50 per hour), the YWCA ($45/hour), Leisure Centre ($42.30) or church (call your local fave for rates) and get the kids moving. Apollo Jump inflatable bouncers, slides, and obstacle courses. Call for pricing. Astro Jump bouncers, boxing ring, climbing tower, giant twister, and more. Pricing listed on the site. Sask Reptile Show Have a wrangled reptile as a party guest. Sand Magic Creations Kids peel back sections of a picture which are sticky underneath, pour coloured sand overtop, and repeat until they have a piece of art. Esthetics by Katelyn does in-home services for your birthday kid and co. Wet Paint Pottery Get your artist (over the age of 6) working on their newest creation. Pottery parties are $10/person plus the cost of pottery, splatter parties are $22/person, canvas are $25/person. Included is two hours of studio time, a staff member to assist you with your party, supplies plus glazing and firing, and a special party gift for the guest of honor. The host may bring cake and drinks for the party with a fridge and freezer available. We Move SK Parties start at $175 with movement and music, dance, yoga, acro, and yoga options— there’s something for every age and interest. Keep in mind We Move can also come to you for a class, although if you do choose to use their studio, it’s worth the extra $50 to upgrade to a 2-hour where you get use of the studio for a dance party, gift opening, and cake time with tables and chairs (and clean up) provided. Western Development Museum Step back in time, and into a kid-approved good time. Boomtown, a fun house, plus lots of interactive exhibits. Five and under are always free, kids are just $5, and if you’ve got ten or more kids and book a day in advance, that rate drops to $3.50. There are also several rooms to rent, an extensive catering menu, and a restaurant that’s also able to be booked out. Add in an old-time photo from the studio and you’ve got a memorable birthday. Wide Open Theatre Wide Starting at $250, Wide Open offers a 20 minute puppet show, paper bag puppet craft, birthday song, and a space for food and cake (yes, you can bring your own). They will also come to your location to perform a puppet show, starting at $150. Wilson's Stoked Centre Bouncy castles, ziplining, a sky trail, and go-carts are a big draw for most kids. Packages start at $15-$25/kid and since there’s a concession and so many activities available, there are add-on options galore. Note that kids under 3 can no longer jump on the bouncers. Saskatoon Zoo Kids are free under 5 years and groups of 6 or more get 50 cents off each admission, but heads up that if you do a zoo day you can’t bring outside food into the zoo gates. Instead, plan to picnic in the beautiful adjacent park or do a pizza party at the on-site concession. Bonus points for the two awesome playgrounds available! And if you want something more personal, between April and October, you’re able to book educational animal encounters for only $80/group. Amazing. Wow, right? But I bet you can think of one thing I’ve missed that should be on here so share away and I’ll add providing it makes sense!